Brilliant red canna lilies splash color into my backyard patio. IN THE THREE MONTHS I couldn’t use my Canon DSLR EOS 20-D this summer because of a broken right shoulder, I feared I would lose my photography skills. But I didn’t. This week, with my muscle strength returning and weight restrictions eased, I did my first photo shoot using my 2.5 pound (with a short lens) Canon. I experienced joy, pure joy, picking up my DSLR and focusing on subjects in glorious light. I started in my backyard, easing myself into the comfortable familiarity of pursuing my passion. I felt giddy with excitement as I photographed a monarch caterpillar clinging to a leaf near milkweeds that free-range seeded. A segment of a canna leaf. I moved to potted plants and blooming flowers and garden perennials. And then I noticed, as I roamed about seeking photo ops, a mini chrysalis dangling from the side of the garage and camouflaged against the green siding. I moved in close, delighting in my discovery. Polka dot plant leaves up close. As I shot more frames, trying different angles, new perspectives, I remembered just how much I love this art. I seek interesting ways to present what I photograph. I seek light that will enhance an image. I consider textures and color and backdrops and distance. I challenge myself to think and photograph outside and beyond the norm. All of my skills, retained in my rote memory, returned. And so did the passion, full-blown and beautiful and aching to be released. Hibiscus acetosella soar in pots on my patio. It’s good to be back, camera in hand. Three of the cameras from my collection of cameras once used by my parents and/or me. IF PHOTOGRAPHERS never embraced change, they would still shoot with an old Brownie or a Polaroid or some other camera long ago obsolete. That said, here’s how I handled the recent death of my Canon EOS 20D. I wrote about the unexpected demise of my DSLR in a late February post. That story generated great discussion and input, some of you encouraging me to challenge myself with a much-upgraded camera. Others suggested I stick with what I knew. 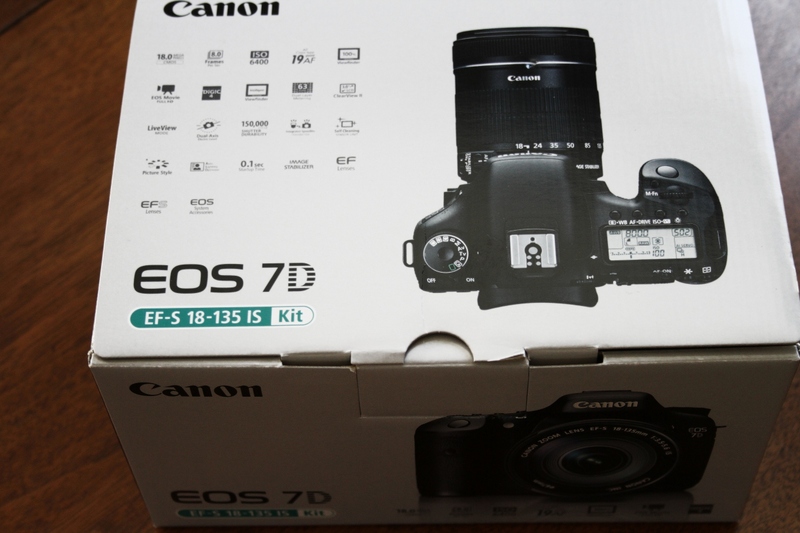 In the end, after trying a Canon 7D and much stress and agonizing over its operation, I purchased a Canon 20D from my friend Lee. It’s exactly like my old one except for the telephoto lens that came with this used camera. Lee was happy to get his unused 20D out of basement storage, thus solving my problem. I can almost hear the uproar, the outcry, the “Oh, she could take much better photos with a better camera.” True? Perhaps from a technically perfect perspective. Too much camera for me. For now. But the bottom line is this: Focusing on the operations of the camera—worrying about f-stops and ISO and shutter speeds—stressed me and took the joy out of my photography. I lost my passion and artistry. Rather, I thought mostly about settings that would assure I had enough light or correct depth of field, or whatever I needed to even take a decent photo. I admire photographers who can handle all of that without flinching. I suppose in time, I would have learned. You can argue that. I already had the basics down from my days of shooting with film. Just trying to operate the newer 7D, I learned more about the manual options on my 20D. That is the good that came out of this. 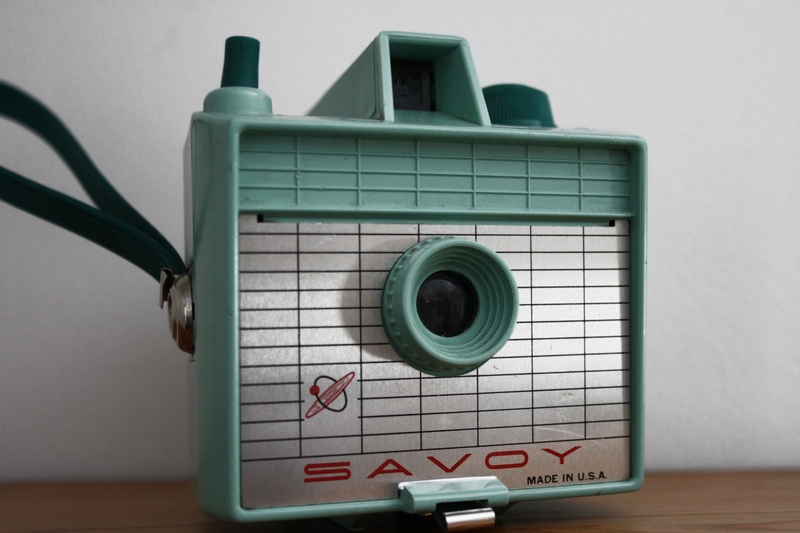 I used this camera as a teenage. But the single thing that this Death of a Camera reinforced for me is that it’s not always about the camera. 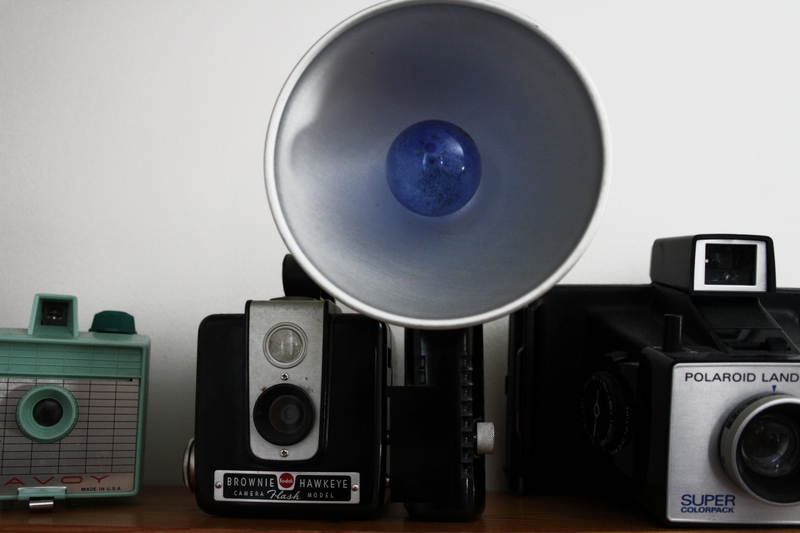 It’s about how you take photos (perspectives and angles and composition, etc.) and the subjects of your photography and lighting that create memorable images. Like a writer, a photographer has a voice. What is my voice? It is, like my writing, down-to-earth detailed and about a sense of place. 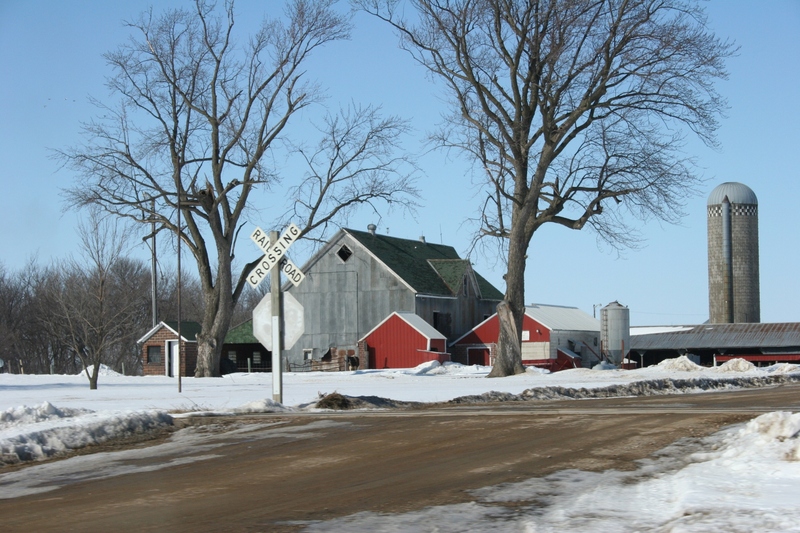 Rural and small town Minnesota (mostly). Close-up. From a distance. The people who live in this place. I strive to photograph that which others pass but don’t truly see. I strive to connect you, via my photos, to this place I love. To the ordinary, which is often the extraordinary. My photos are copyrighted and may not be reproduced without permission. If you are interested in purchasing rights to use my images, please check my “About” page for contact information. I am grateful to the individuals, ad agencies, authors, charities, magazines and others who have found value in my photos and purchased rights to use selected images that meet their needs. Most of all, I am grateful to you, my readers, for appreciating my photography. 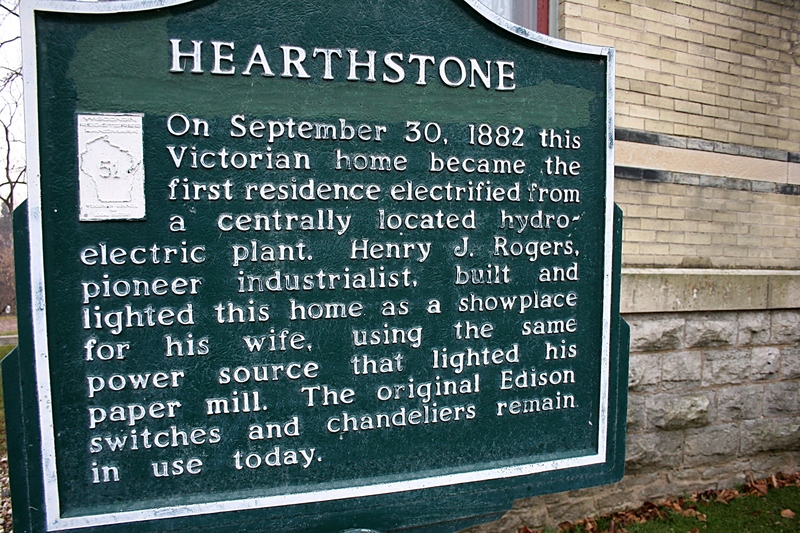 The main entry to the Hearthstone Historic House Museum in Appleton, Wisconsin, located at 625 W. Prospect. Post a sign with that message or speak those words to me and you’ll find yourself with one unhappy woman. I can’t help it. My camera is a natural extension of me, so when I can’t photograph I’m unsettled and discontented. I never expected to encounter a photo ban at an 1882 historic home I toured in Appleton, Wisconsin on Saturday afternoon. 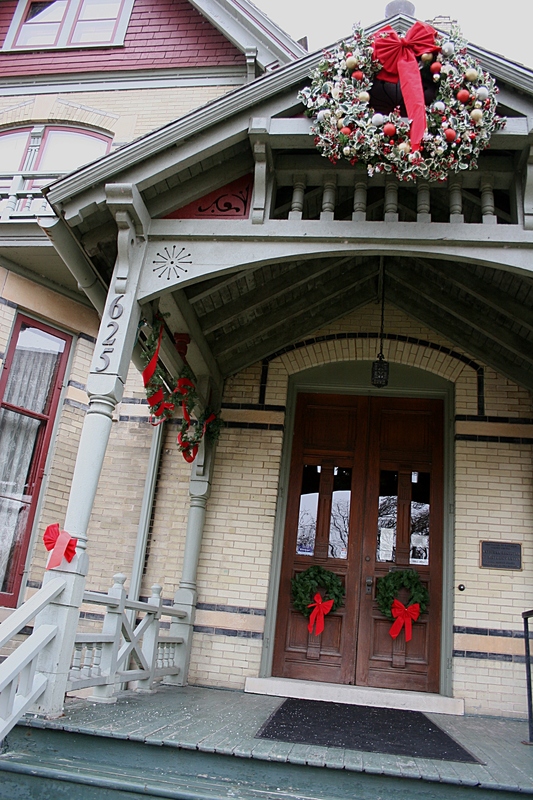 But I hadn’t even reached the wreath-adorned double front doors of the Hearthstone Historic House Museum when my daughter pointed to the sign banning photography. I automatically hugged my Canon EOS 20-D DSLR closer to my right side as we waited for a tour guide to unlock the front door and allow us access into this Victorian home, the first residence—in the world—electrified from a centrally located hydroelectric plant. If you think I would simply accept the “no photos” rule without question, then you don’t know me. I asked and was told photography would be disruptive to the tour. “Even without flash?” I pursued. I contemplated for some time how I could sneak in a photo or two. But with tight quarters and visitors packed into the home’s rooms, taking covert photos wasn’t even a remote possibility. Besides, the click of the shutter button would surely give me away and I was not about to become the first tourist kicked out of this lovely mansion. So you will need to settle for exterior images of this house built for Henry J. Rogers, today’s equivalent of the CEO of the Appleton Paper and Pulp Company. He lived here with his wife, Cremora, and their daughter, Kitty, for some 10 years until the nearby paper mill was destroyed by fire. 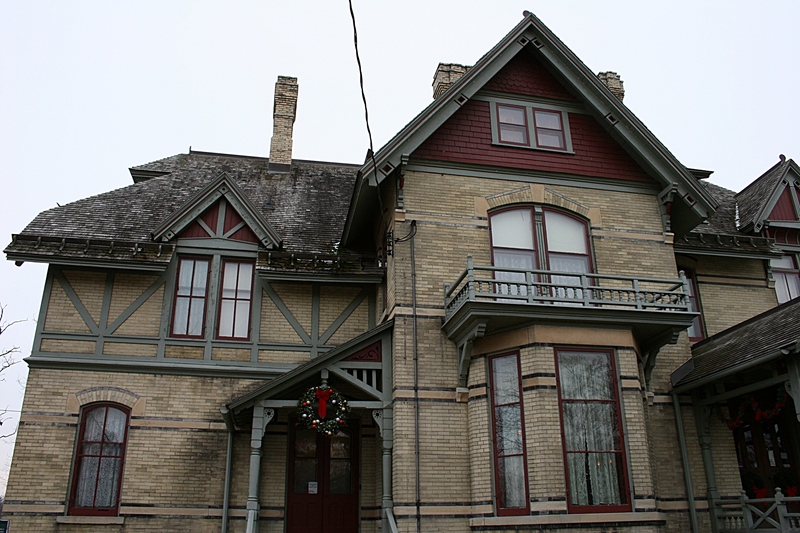 The original home of Henry J. Rogers and family sits along the Fox River. From the exterior, this hilltop riverside home, built for $17,000, isn’t nearly as impressive as I’d expected. But inside, ah, inside, the décor is about as opulent and detailed as any historic residence I’ve ever toured. Nine fireplaces grace rooms defined by wood—inlaid floors, detailed carvings, wood trim and ceilings and, well, wood everywhere. But I suppose when you live in Wisconsin and head up a paper company, finding wood to construct your mansion isn’t a problem. An Edison phonograph, a stained glass window in the grand hall entry, floor-to-ceiling windows and a hand-painted ceiling in the parlor, the focal point fireplaces, and a dining room table set for Christmas dinner all impressed me. A sign explains the house's historical significance. The house is on the National Register of Historic Places. In retrospect, I suppose I should have been most impressed by the rare 1882 light switches and electroliers still in operation. After all, the lighting ranks as the reason this home holds such historic value. But, honestly, I’m not all that scientific minded. The décor and personal stories shared by our tour guide interested me far more than the hydro-electric powered lighting system. Our guide informed us that the Rogers family was charged $1 a month per light bulb for the 50 light bulbs in the house. In the 1880s, $50 was a sizeable chunk of money to pay for monthly electrical usage. That reveals the substantial wealth of this family. Rogers, however, eventually died with only $12 to his name after moving to Chicago and losing money in a silver market that crashed, a second tour guide later told me. The story, though, that truly snatched my interest involves Kitty. When she became engaged, the Rogers’ daughter verified the authenticity of her diamond by etching her and her fiancé’s initials into a library window (still there). Not to be judgmental here, but I was not at all surprised when the tour guide revealed that the marriage did not last. Later, while touring the second floor, we were informed that Henry and Cremora slept in separate bedrooms because the couple thought they would catch tuberculosis from one another by breathing in the same night air. OK, then. But, I suppose I must consider the time period and the lack of knowledge regarding diseases. Finally, the tidbit I found most personally appropriate involved visitors to the Rogers’ mansion. They would leave their calling cards, the equivalent of today’s business cards, on a table in the great hall. Visitors would bend the corners of their cards in a certain way, depending on the reason for their visits. The family would then decide whether they wanted to see the guest. At that point in the tour, I considered scribbling “Here to take photos” on my business card and dropping it onto the foyer table. 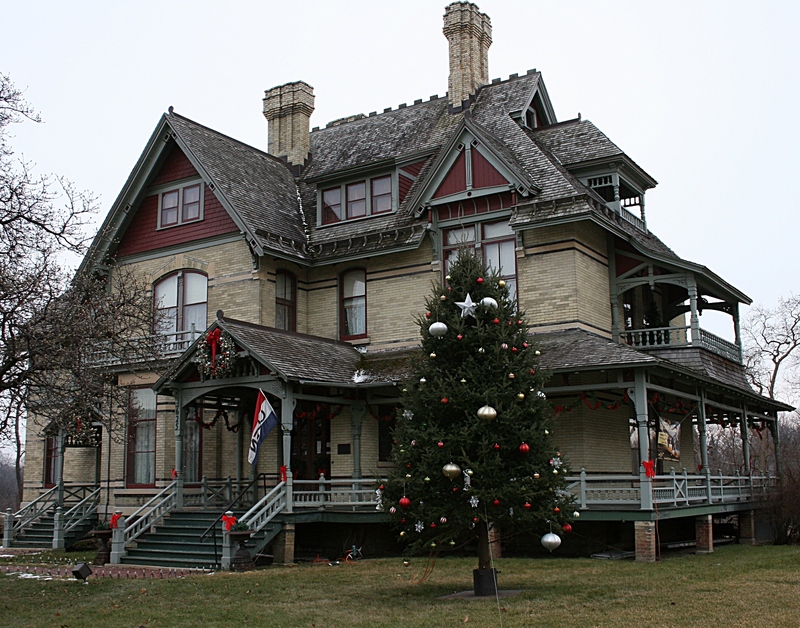 The Rogers' home, which was home to nine other families and which once housed a restaurant called The Hearthstone in the 1930s, is not yet fully-restored to the 1880-1895 time period. 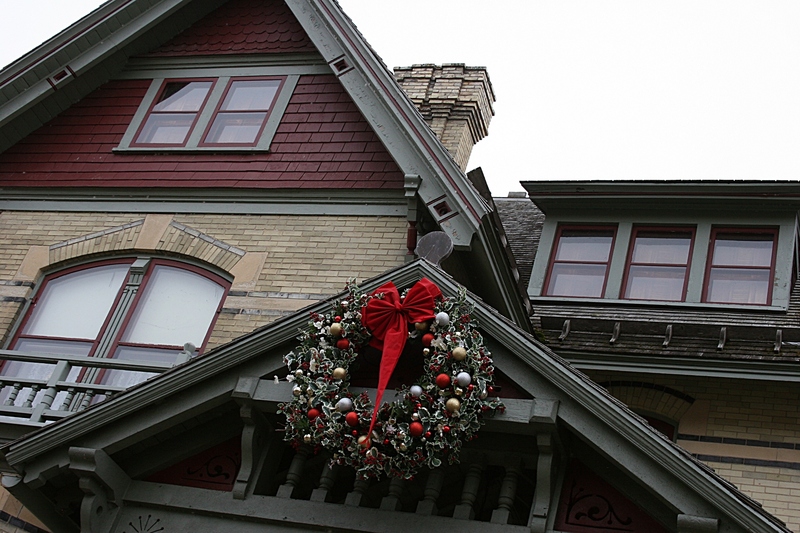 Inside and outside, Hearthstone is decorated with Christmas trees and other holiday decor for a "Victorian Christmas" special event which continues through January 14. NOTE: Lest you consider me disrespectful of rules, I am not. I understand, somewhat, the “no photography” rule at the Hearthstone house. And I most certainly understand why flash photography would not be permitted in an historic place. One other point I want to mention: During my tour of the Hearthstone mansion, a visitor’s cell phone rang and she proceeded to answer it, right in the middle of the tour. Now that I found disruptive. HOW OFTEN HAVE YOU been traveling along a roadway, saw a subject worth photographing but were in too much of a hurry to stop? That’s happened to me more often than I wish. However, I’ve found a solution that’s worked well with some incredible photo results. I’m issuing a disclaimer here, though. I’m not advocating photographing and driving. This photographic option should be used only when you are a passenger because you’ll be operating your camera while your vehicle is moving. First, set your camera at a sports action shutter speed, place it on your lap, grip the camera body and be prepared to snap away at a moment’s notice. Click. Click. Click. With a fast shutter speed, you can quickly fire off three frames before you’ve bypassed the intended subject. OK, it’s not quite that easy. You must anticipate just the right moment to take your photos. That means paying attention to what lies ahead of you along the roadway. Click too soon and you miss the shot. Click too late and you miss the shot. It’s partially luck, partially skill that will nail a great photo. 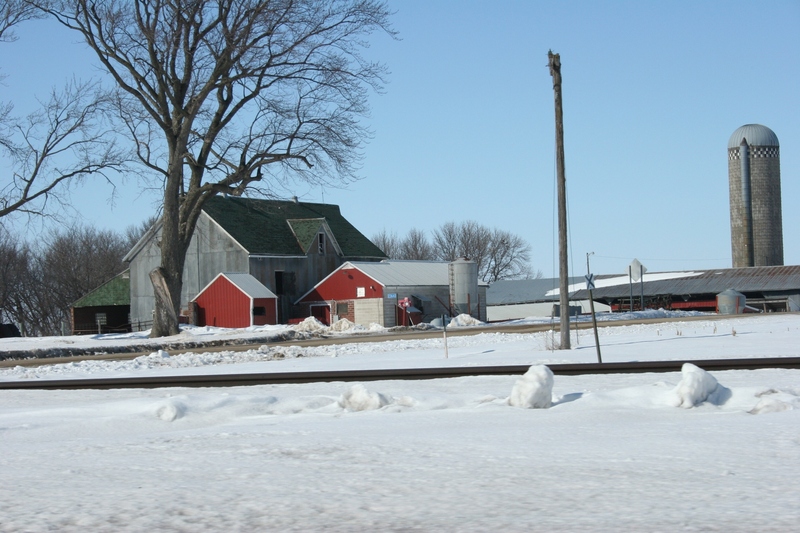 I’m always watching too for telephone and electric poles and roadside signs that can obstruct an otherwise good image. I’m also always trying to balance my photos so they are well-composed. All of this moving of the camera and adjusting the lens and framing the image must happen in a split-second. I can’t even begin to tell you how many shots I’ve missed because I’ve moved too slowly or failed to notice a photo op until it passed me by. That’s the other part of successful on-the-road photography. You need a watchful eye for subjects that will make interesting and great photos. Too many people look, but don’t really see, what’s around them. 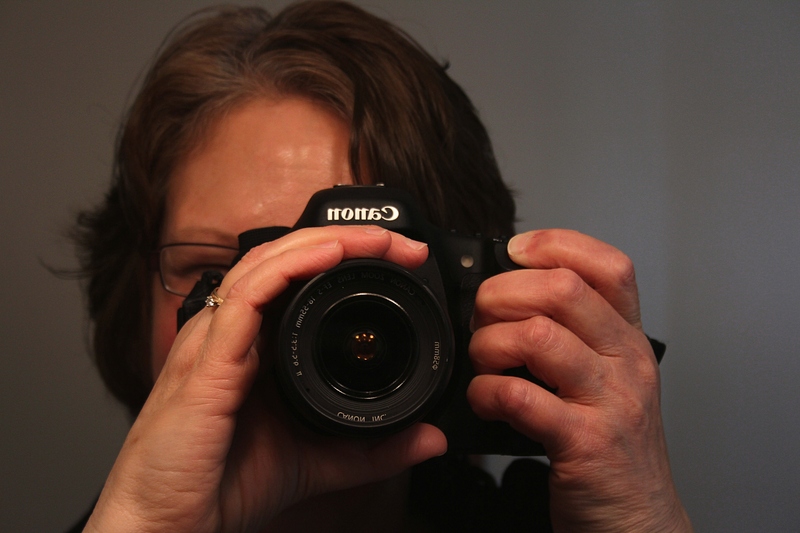 Perhaps because I’ve grown so accustomed to viewing my world through a camera lens and because I’m a writer, I notice more than the average person. Yet all of this effort will be wasted if you’re shooting through dirty vehicle windows. Clean your windows. 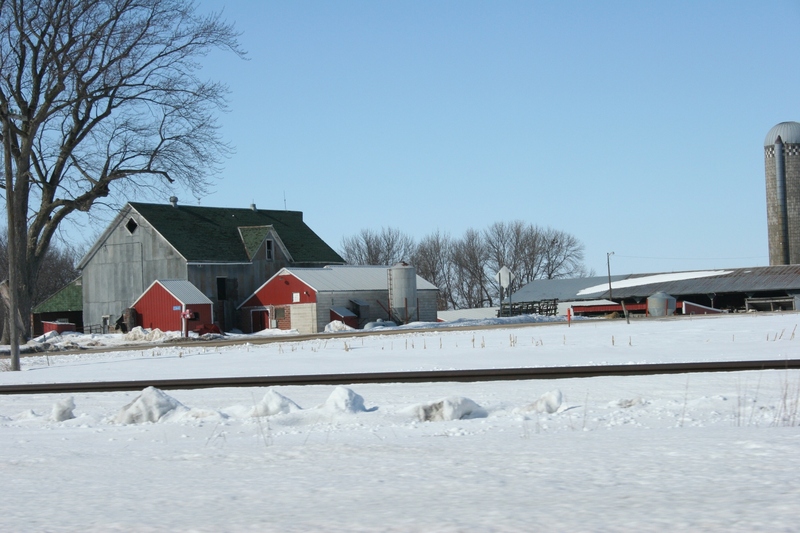 If you live in a state like Minnesota, where road spray from sand and salt and melting snow is a problem, you may just have to abandon this traveling photo option in the winter. Unless you’re traveling through a town, at low speeds, I don’t recommend opening your window. You risk getting dust or dirt into your camera sensor. 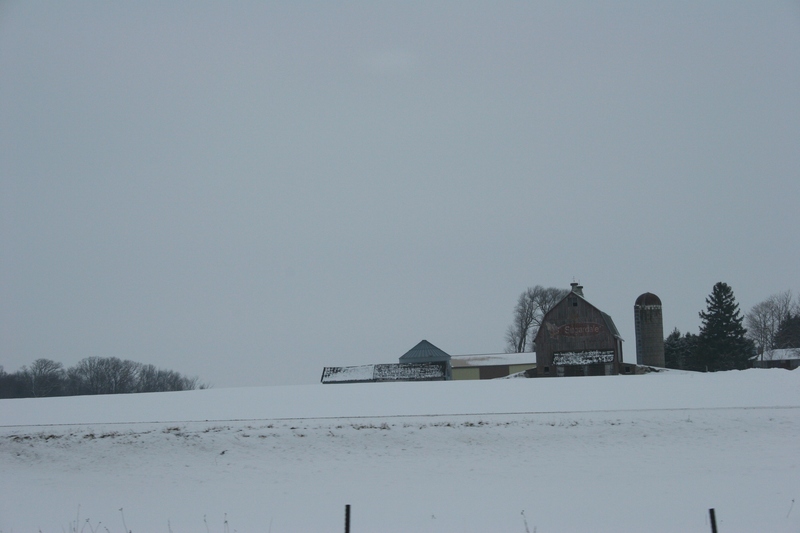 That said, here’s a trio of photos I shot in early March along U.S. Highway 14 between Essig and Sleepy Eye in southwestern Minnesota while traveling at 55 mph. Other than downsizing these images, I’ve not edited them. Here’s why these images are so good. The exposure is perfect. The photos are well-composed. The horizontal line of the railroad track in the first two frames sits at an eye-pleasing one-third position. The color contrasts of red against gray and blue make these photos pop. The subject is beautiful in its simplicity. If you’re never tried traveling photography, give it a shot. You may be as pleasantly surprised as me with the results. 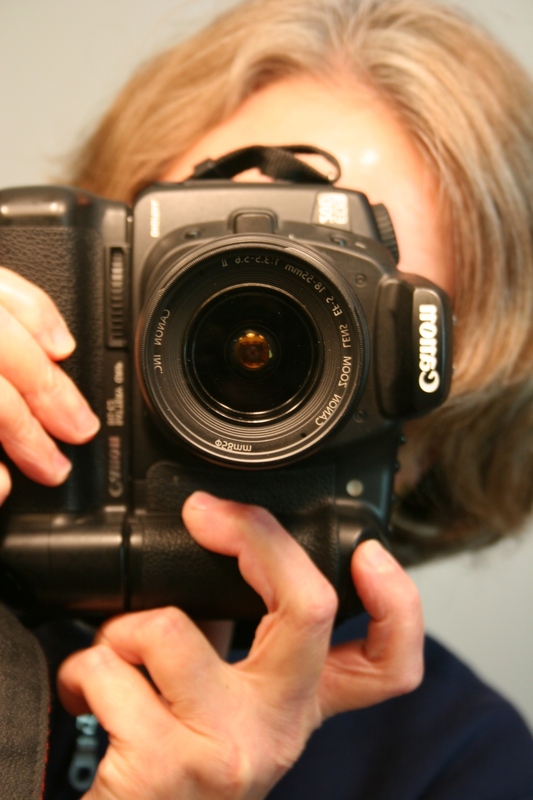 FYI: I shoot with a EOS 20D DSLR Canon camera. Yes, it’s a “fancy” digital camera, not a point-and-shoot. 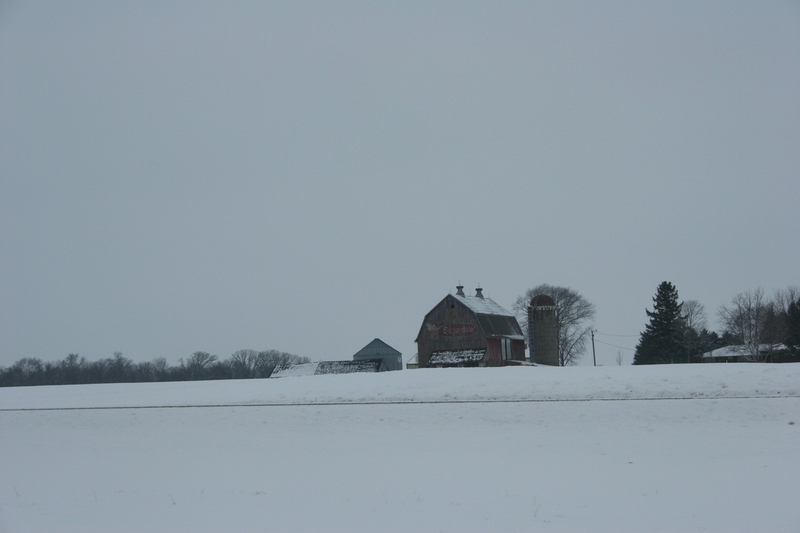 If you ever see a photo on Minnesota Prairie Roots that you are interested in purchasing, please contact me via a comment (won’t be published) or an e-mail.